IMPORTANT - Restrictions on use - For permission to fly and info on stock and landing, BEFORE you fly, a FEE of £1 PER PILOT to to be paid at the farm at the top of Fangs Brow. The £1 flying fee is applicable to all flyers in each vehicle, i.e. four flyers equals £4; please pay BEFORE you walk up and note it is non-returnable. This link shows the yard for Fangs Brow Farm; the link should open Google Street View pointing to the right place. It's the door the Land Rover is pointing at. - Land on the fell area, or in the field marked with an 'L' on the map below. At all costs, do not land in the field to the South East of the road access gate. Doing this is likely to result in a serious farmer conflict for the pilot and difficulties for the club (this field is owned by another farmer who strongly objects to us landing on his property). - Close all gates unless tied or propped open. - No dogs onto the site or fellsides. Popular with local pilots and, on the right day, worth a longish drive. 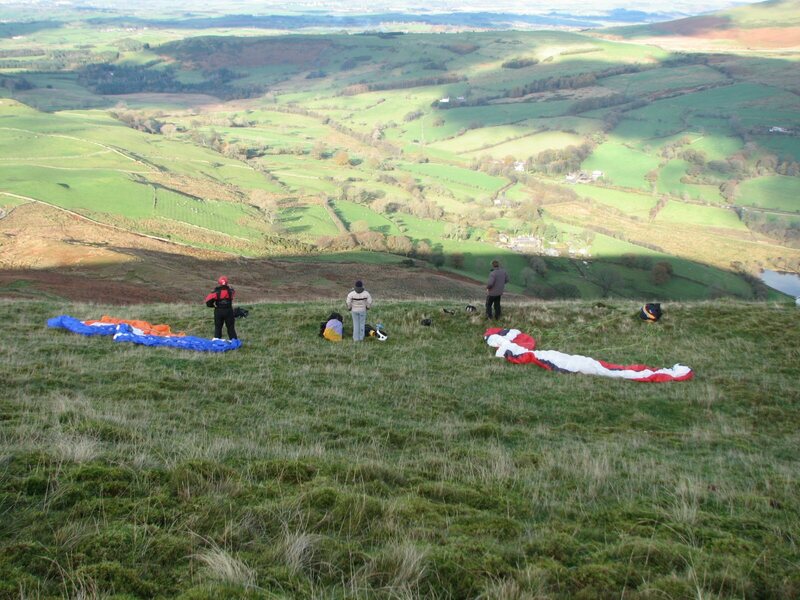 The flying here can be very good with spectacular scenery and a great place to escape the crowds. It is one of the few northerly sites available but note that in summer it can seabreeze early from the west (safety not affected). 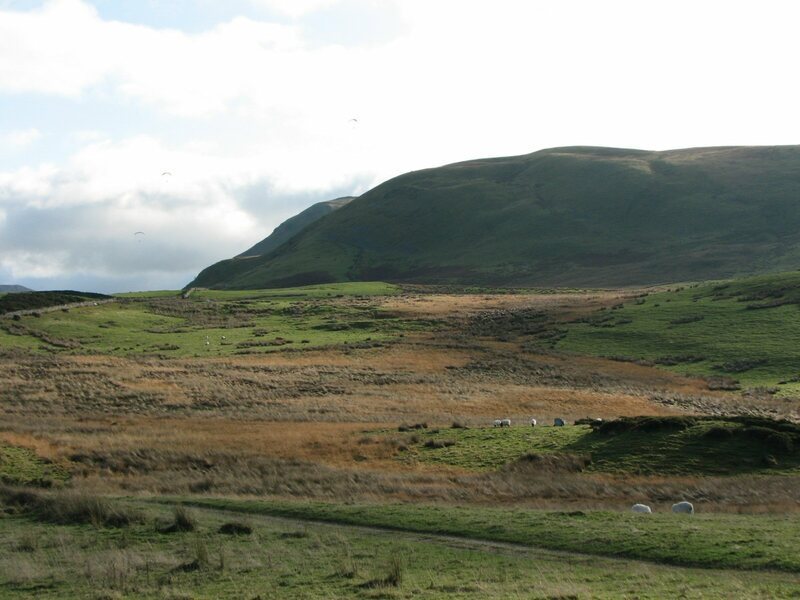 Burnbank offers various XC opportunities from short first steps to full on epic mountain flights for the experienced. Grange Country House Hotel. The postcode covers a large area. The hotel is one mile north of the flying site and lies to the east of the parking area. The best approach is from the A5086 via Mockerkin. 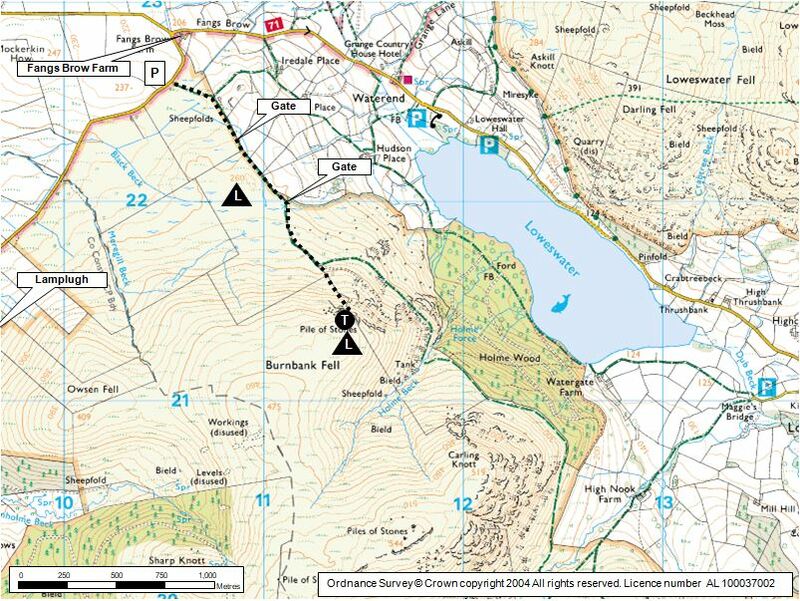 Alternatively, the site can be approached via the scenic route from Keswick - this follows the Whinlatter Pass and the Lorton Vale to Loweswater. Parking is on the side of the road outside the entrance gate. From the entrance gate follow the unsurfaced road. After the next two gates strike off straight up the fell. Initially the path is indistinct but becomes obvious where it becomes steeper, this final section of the walk up is a short but steep haul. Once at the top there is a good choice of flat grassy take offs. Hang glider pilots may seek permission to drive to the foot of the hill (track becomes impassable in the wet), unload and then drive back to the road to park. Mr William Clark, Fangs Brow Farm. Suitable for novice CPs as long as they don't stray from the site and they respect both windy days and strongly thermic days. Beware of turbulence in fresh winds. The site can become increasingly turbulent the more easterly the wind and the stronger the wind. If going XC: Before going deep into, or high over, the big mountains make sure you know what you're doing & where you are going. Otherwise fly in radio contact with a competent guide and ensure you don't lose height close downwind of summits or behind spurs thereby dropping into rotor and severe turbulence. If it's a windy day (over 10mph?) think twice before making committing moves! NOVICES BEWARE!!! One of the few northerly sites available this is a favourite with local pilots and worth the drive on the right day. There are various grassy take off areas allowing for differing wing directions. Beware of turbulence in fresh winds, especially so if there is an increasing easterly component to the wind. In summer the site can seabreeze early from the west becoming un-soarable, but without particularly affecting safety. This site has excellent top and bottom landings. There is a very big flat grassy area extending behind take off and the site is generally 'top landing friendly'. When bottom landing please land on the fell area, or in the field marked with an 'L' on the map below. At all costs, do not land in the field to the South East of the road access gate. Doing this is likely to result in a serious farmer conflict for the pilot and difficulties for the club (this field is owned by another farmer who strongly objects to us landing on his property). Given the right wind conditions; the flying here can be very good throughout the year, spectacular scenery and a great place to escape the crowds. Burnbank offers various excellent XC opportunities from first short steps to full on epic mountain flights for the experienced. A flight 1km SE to Carling Knott and back is easy. Flights towards the Kirkstile Pub and then onto Melbreak give plenty of landing options and we have permission to land in the fields you will fly over. For experienced XC pilots: Due south the terrain is remote and care should be exercised, the potential for a long walk out is quite high! The ridge from Red Pike to Herdus works well and a flight over High Stile and the Buttermere fells or a crossing over Enerdale enables further options. The photo shows where not to land! In the centre of the picture is the parking area by the road with the path leading up onto the fellside coming diagonally right towards the camera. 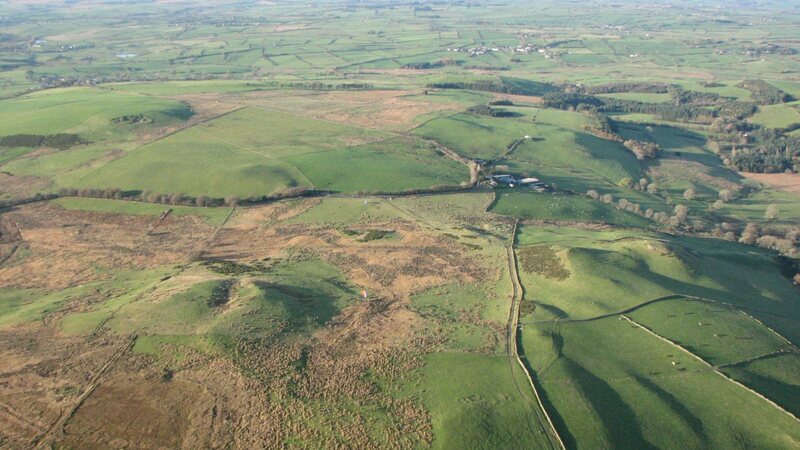 The correct landing area is above the first gate on the fell, i.e. the rectangular grassy area to the left of the wall in the middle right at the foot of the photo. Notes : Good range of local real ales and excellent food. Notes : Phil Kew says "A Tricky triangle with strong winds, turn points were Honister pass, Bleaberry fell and a fantastic return leg over Grasmoor, finished off with a pint of Loweswater Gold in the Kirkstile Inn with the lads." Google Street View - Parking Burnbank on a nice day, parking is on the left.